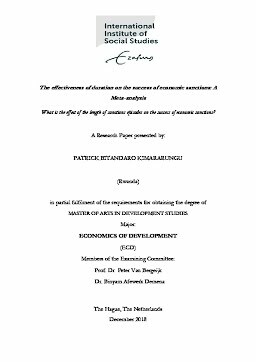 Erasmus University Thesis Repository: The effectiveness of duration on the success of economic sanctions: a meta-analysis: what is the effect of the length of sanctions episodes on the success of economic sanctions? The effectiveness of duration on the success of economic sanctions: a meta-analysis: what is the effect of the length of sanctions episodes on the success of economic sanctions? The focus of this study is to investigate the sources of differences in the reported duration effects on the success of economic sanctions using meta-analysis. We analyse the contradic-tory views of the primary authors results and how they are affected by publication bias and estimation methods, specification, publication and data characteristics. Our meta-data set consists 13 empirical studies which are all published between 1985-2017 with 73 observations on the variable of interest. The results show that reported duration effects suffered from negative publication bias and confirm an absence of the genuine effect on the success of economic sanctions. However, we further analyse if these findings are influenced by other factors and the results show, specification characteristics affects mostly the reported duration effects more than others whereas estimation methods have no effect on duration. Controlling for such effects, that the duration meta-effect is negative and statistically significant at the 99 per cent confidence interval on the success of economic sanctions: longer duration is associated with lower suc-cess rates. The general to specific method does not affect the publication bias towards neg-ative estimates.